Greetings from Austin, Mojoers! 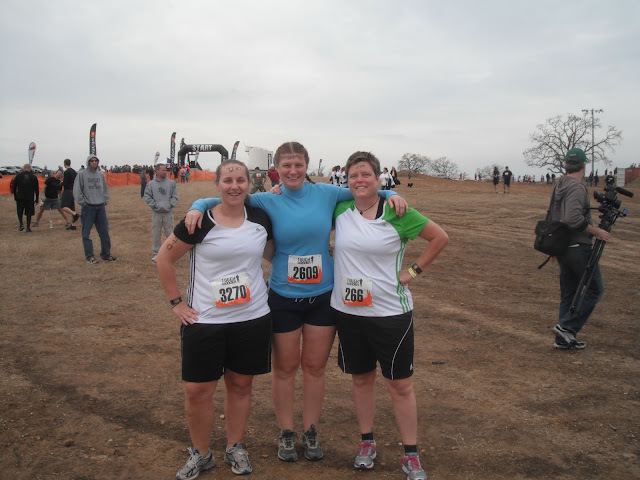 I just finished "running" the Texas Tough Mudder course yesterday and have the black and blue legs to show for it. 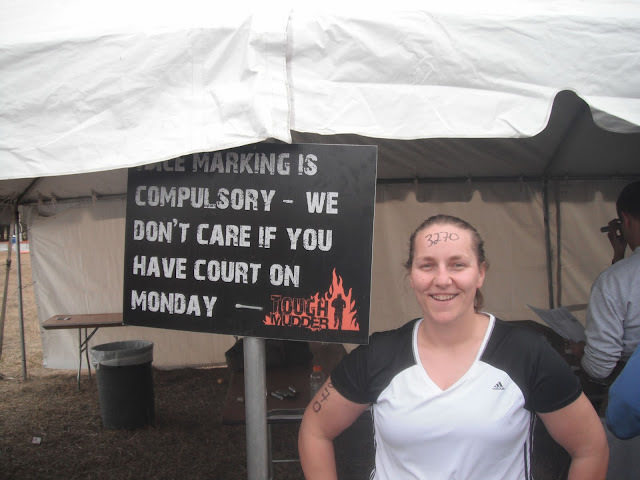 I don't really have a race report (or any pictures this time around, bummer!) but here's a summary of the event and a lot of reasons why you should do it. The theme of the day was, "Hey, Army guy" because, 1) there were a lot of muscular military men around so why not try to get their attention, and 2) I needed a lot of help because I have no upper body strength. The event began with the national anthem prior to the start of each wave, during which many people stood at attention, pretty neat to see. Then a quick summary of the spirit of Tough Mudder and lastly, a recitation of the Tough Mudder code, which is essentially, this isn't a race but a team thing, help each other out, don't complain, and some other things like that. The course was on a motocross track so the first few miles and the last few miles wound around, going up and down what used to be jumps and the spectators were able to wander between the different obstacles and take pictures of their people participating. It's pretty cool that they did that, and also explains why there's a $15 spectator fee. The first three or four obstacles (here's a link to the race course) were all mud ones (including a muddy ice bath) and variations of the "Kiss of Mud", which we had to do two loops of. Not hard in and of themselves, but going up and down those motocross jumps was really annoying and tiring. And it didn't feel like we were making any distance but rather running around in circles for a few miles. Then came a water crossing which was COLD and through an uneven and muddy lake floor, so we kept tripping and falling into that frigid water, which prepared us for the event I was most looking forward to: Walk the Plank, where you jump off a 15 foot platform into freezing cold water. But first you have to get onto said platform, which was one of the hardest things I had to do all day, and where "Hey, Army guy" came in quite handy. I was then literally forced to jump by the guy at the top (you want me to jump where?) and almost had a panic attack when I hit the water. Bondy jumping. It looks a lot higher from the top. O.M.G. That water took my breath away. I was underwater for what felt like forever and seriously thought I would pass out before I got to the surface (seemed to be a theme for all the Mudders I talked to afterwards). Once I did get some air, I briefly thought about asking for help getting me to solid land because I was so frozen and freaked out, but didn't want to be "that girl". Instead, I just kept repeating "Oh my God, oh my God" and slowly waded to the bank. The guy who we'd been running alongside for the first 2-3 miles had jumped right after me and needed a very long breather to calm himself down, so it was nice to see I wasn't the only one having an issue with this obstacle, especially since I jump off things into water all the time and never have a problem with it. Next was a long swim through freezing water (about 50 m), which wasn't too bad because I was already numb from the long swim to get to Walk the Plank, and then more going up and down motocross jumps and running forever but seemingly getting nowhere. Those mile markers couldn't come fast enough! Eventually we headed out for the long run out into the cow pastures, during which I was somewhat grateful the sky was overcast because it was getting a bit warm, and the mud was starting to harden on my face, hands, legs, and pretty much everything. It was getting annoying. As soon as we'd all started to warm up, we came across another freezing pond we had to swim cross (the designers of this course are EVIL) and more mud and tunnels to crawl through. All that was followed by even more running through cow fields and Texas hunting grounds. Eventually we headed back towards the motocross track (or at least it seemed like it) but in fact we criss-crossed through the forest/shrubbery and across more creeks and ponds for a couple more miles. That water was so freaking cold and the miles seemed to drag on forever. Maybe it's because I'm slow runner or something, I don't know. But 10 miles is far. Oh, and during that run, I think they wanted to keep us on course, so they set up signs that said "Beware of velociraptor! Stay on trail." And then a minute or so later you'd stumble upon a large metal cage with a kid-sized stuffed dinosaur inside. These people are creative! We hit civilization (that is, the spectators/the motocross track) around mile 7 and were greeted with a substitute for Fire Walker, which got canceled because there was a no burn order in place. I'm kind of glad because this new one rocked. It was a smokehouse with a deep mud pit inside, but you couldn't see anything and just slid into it without realizing what was happening. All you could see was outstretched arms reaching over the edge on the other side helping people up the slippery and muddy slope. And then we emerged to be photographed by spectators. It was kind of nice to do something they didn't see. Like it was our own little thing, and it turned out to be one of the favorites of a lot of people I talked to later. And looking back on this obstacle, it's kind of weird that we had no idea what was in that house but we climbed in blindly, as if it was normal. That could be an interesting case study into the kinds of people that sign up for these kinds of events. End side note. 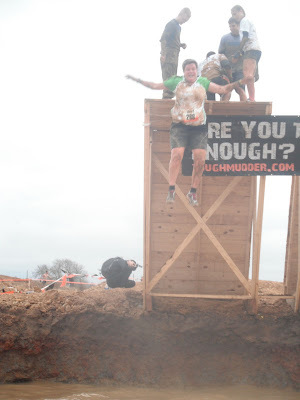 The best picture I have of me and the mud (mile 1.5-ish). Not quite as impressive as what came later in the race. 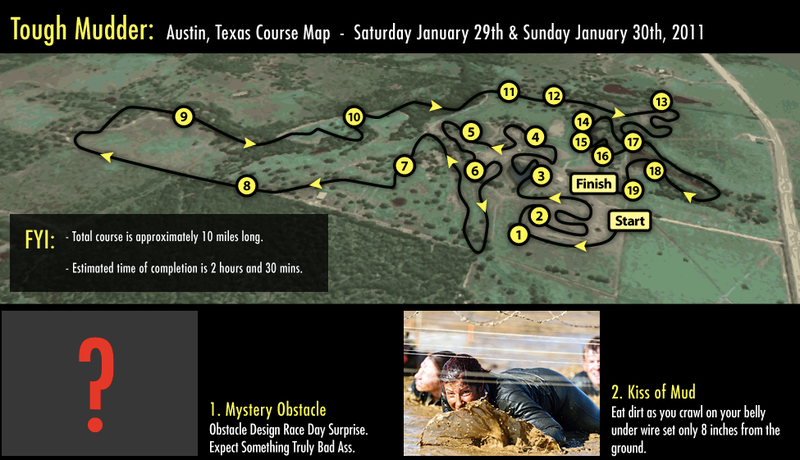 More running ensued, including the most frustrating part of the course: the Mud Mile (The Trenches on the map). I have no idea where they found so many types of mud, or consistencies for that matter, but I was impressed. This thing was so frustrating because all you did was go into a super thick mud pit, stumble out sliding all over the place, only to go into another mud pit not even two feet away. If this thing had indeed lasted a whole mile, it would've really sucked. But I think we only did 10 of these or so...enough to be coated in about an inch of mud head to toe. And this is the time I was most bummed that my camera had crapped out. There are no words to describe the amount of mud covering us. It was like we’d taken a bath in chocolate, it was so thick. 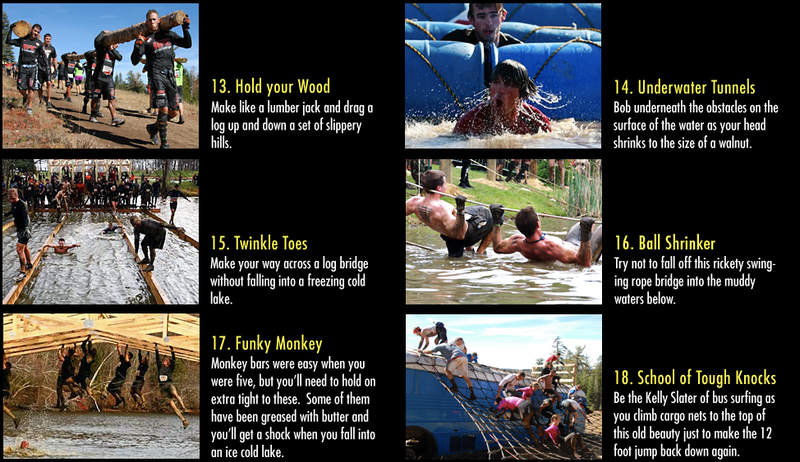 One of the funnier aspects of the race was the Hold your Wood obstacle where you carried logs a quarter mile or so. The macho military guys of course grabbed the largest trunks they thought they could carry, while the smarter groups of us took the dainty logs more suitable for a medium-sized fireplace. Not even halfway around the loop, the macho dudes had dropped the logs and were rolling them up and over the motocross jumps. Suckers! What I like to call The Cramp Mile came next where most people started developing calf cramps. 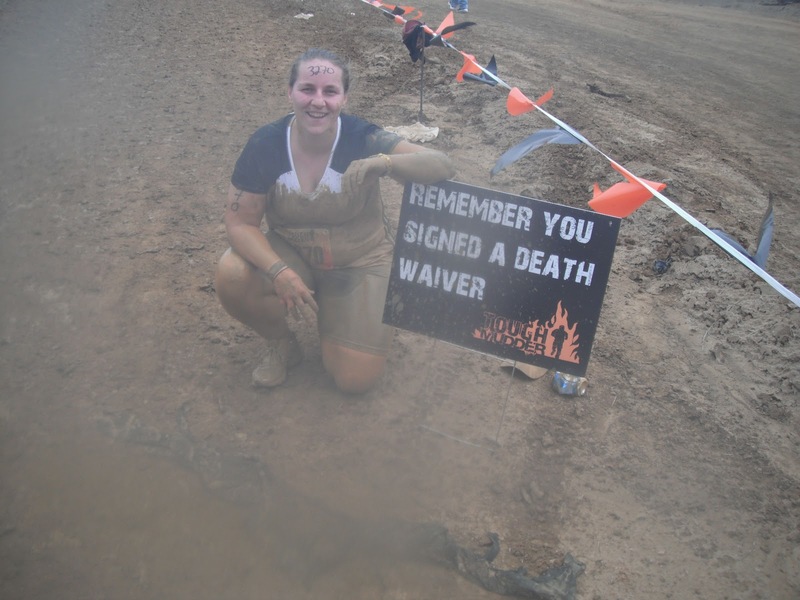 It was like a minefield with people stretching on both sides of the trail, which led us to The Underwater Tunnels (in zig-zags, of course, because Mudders don’t take the direct route…that would be stupid). The barrels holding the whole structure afloat had started to blow away so they closed it right before we "got" to do it, but the swim across that frigid lake was hard enough for me, especially since next came The Ball Shrinker that drained any sort of upper body energy I had left. And the sign in front of this obstacle? "We could've made the obstacles wider but getting you wet and cold is just another way we break you." It worked. By that point everyone was so exhausted and tired and wet and cramping that the last thing we wanted to do was go back in the water. 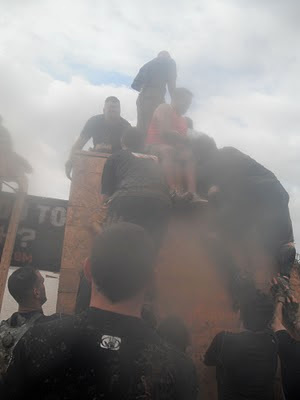 But the next three obstacles were water-based, and by that point the spectators had gathered around them and were taking pictures and oohing and aahing whenever someone wiped out. I was super jealous of their warm and dry clothes, as was everyone else, I assume. I remember someone pulling out an orange and I kinda wanted to grab it from them. But that wouldn't have been very nice of me. The organizers saved the best for last. 200 feet from the finish line was the Electroshock Therapy, which consists of an evil contraption of live hanging wires, some of which carried a sizeable shock. All this was over a mud pit so you were bound to get shocked, lose a shoe, and fall on your face...in front of a large crowd of spectators. Yup, they were standing there three-deep in some places heckling us to run through. Like, we'd stop in front of it to catch a breather and the crowd would heckle for someone to run through. And if you got shocked, you could hear the crowd cheer/laugh/enjoy themselves. It was weird. The ungraceful person that I am, I totally got shocked, then wiped out, then some dude ran into me, and I got shocked again. Ouch! And then I ran across the finish line, got handed a bright orange headband, a heat blanket, a beer, and a whole bunch of nutrition products. Not a bad end to the race. Trying to get warm post-race (L to R: Me, Maggie). P.S. It's 70 degrees outside. We didn't hang out much at the after-party because we just wanted to get clean and warm. I had on sweats, a fleece, a jacket, a heat blanket, and a beanie and I just couldn't warm up in the 70-degree weather. I think I was just super tired and hungry and needed a nap. So we headed back to the hotel to get clean and try to wash some of the mud out. Then we headed out to downtown Austin to hit up the bar scene (that's a story for another day…that town is very interesting). 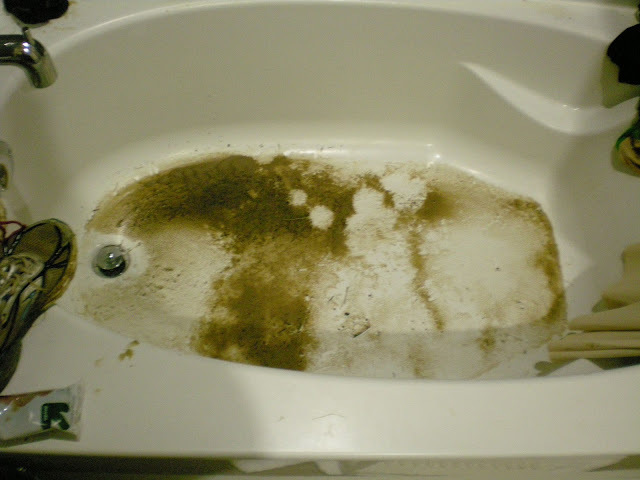 The tub after we tried washing our clothes in it. Being from Boulder, a town where everyone and their mother does extreme sporting events on a weekly basis, having completed something like a triathlon or Warrior Dash (Tough Mudder's little brother) isn't exactly unique. When you tell someone about it, they just shrug their shoulders as if it's something they planned for their afternoon workout. Austin, on the other hand, is much different. 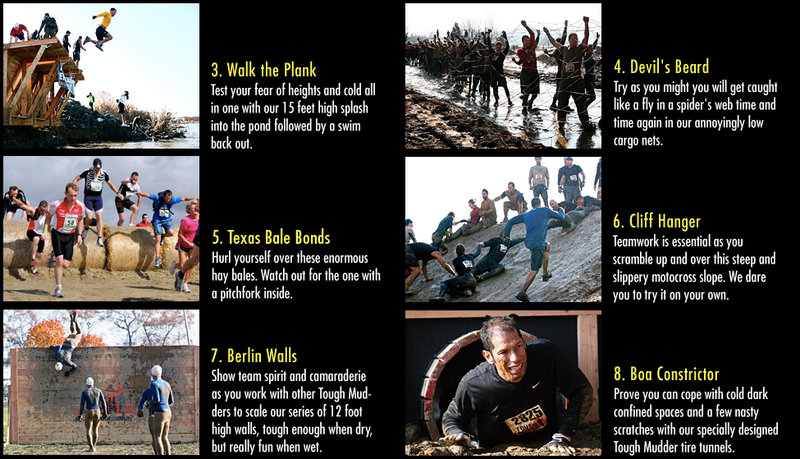 Or maybe it's a Tough Mudder brotherhood kind of thing. I'm not sure. Regardless, it caught me off guard. At the bars Saturday night, whenever we ran into a Tough Mudder, we became instant friends, going back and forth talking about this obstacle or that obstacle, and how hard this part was or the unpleasantness of that. It never got old. All their other friends (and especially girlfriends) would get annoyed and try to get their attention again but no luck. It was really fun to hear from a whole bunch of different people who did the race and commiserate about our collective tiredness, bruisedness, and cuttedness. My legs on Monday, 2 days after Tough Mudder. At least I wasn't limping anymore. 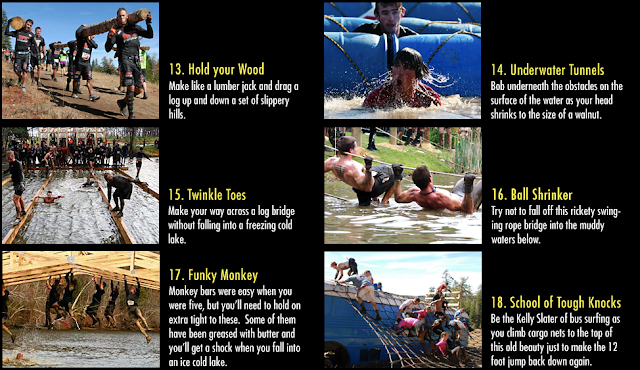 Anywhos, I'm hoping the Colorado Tough Mudder will have the same kind of camaraderie, but I think its location deep in the mountains and lack of a central bar scene near the event will probably cut down on chance meetings in the bars afterward. Also, I imagine the kind of people running the CO race will be of a different kind than the military men that dominated this Texas race. We have a lot of individual athletes in Colorado (making it hard to recruit rugby players, among other things) so I don't know how the group mentality thing will go. But I'm hopeful that we'll at least get some Air Force men and/or other fellow rugby players out there. And about that bar scene issue, I'm doing the Sunday run so it'll be a bit different since I'm sure not a lot of people will go out that night. As for the strange state of Texas, I'm seriously considering going down there again to do this thing because I had such a blast (and I think my friends are in as well!) and they have a good number of non-elevation related and just plain fun obstacles, so we'll see. It's also nice to have a "race" in the middle of winter to look forward to instead of training for months on end without anything to test yourself with. I was taking a cab downtown Saturday night to go out to the bars and got to talking to the driver about having just finished Tough Mudder. He hadn't heard of it, so it was kind of hard to describe. Then he asked a question I honestly didn't know how to answer: "What's the motivation behind doing this race?" Uh...I don't know. I kind of blubbered through an answer involving road races are boring and he seemed to get it, but not entirely. So yes, I don't know what the motivation is, besides the fact that it's pretty awesome and something that will test you in ways you didn't think you would be tested. And here's a link to their events, which are all over the country, and even across both ponds, up north, and Down Under. Now you have no excuse. shoes get muddy, because you are running through mud. At Tough Mudder, all shoes go to heaven (or get recycled and delivered to starving/shoeless children in Africa)." Thanks for reading and commenting! The one in Colorado was super fun and very different from the Texas "race". As expected, it featured lots of walking/running up the mountain but also a fair amount of water obstacles, and snow. I had a blast and would highly recommend it to anyone. A full race report is in the works, but as you can tell by the general silence on this blog, I haven't had much time to post much of anything. Summer classes plus work do not give me too much free time. But the craziness is wrapping up in a little over a week and so I hope to get that done within the next two weeks. I'll comment here when it's up so you don't have to keep checking back. Thanks again for reading.